The new testo 320 is a high-quality measuring instrument for efficient flue gas analysis. Its wide measuring range makes it a reliable partner for eliminating malfunctions and emergencies, monitoring legal limit values or for daily routine work servicing heating systems. 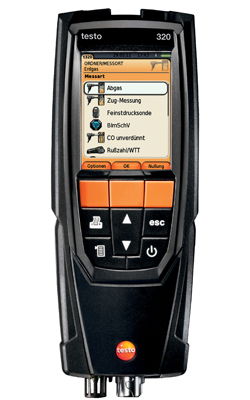 The numerous measurement menus of the testo 320 are clearly structured. Standarized menu procedures, which are stored in the instrument specifically for your country, simplify operation – depending on which standards you are dealing with. The high-resolution display allows a detailed presentation of the measurement procedures and is easily legible even under the worst conditions. The measurement menus and measurement values are presented in detail and always easily legible. Integrated traffic light system which continuously monitors the sensor functionality. Automatic zeroing of gas sensor in only 30 seconds after start up, which can be cancelled if not required. Easy exchange of sensors by the user – no adjustment necessary. Up to 500 measurement protocols can be saved and called up in the memory of the testo 320. Operation with a Lithium battery (1500mAh) – no battery change necessary, up to eight hours running time, charging via USB connection possible. Integrated magnets for fast attachment to burner/boiler. The flue gas analyzer testo 320 is TÜV-tested according to EN 50379, Parts 1-3. Robust, durable instrument – ideally suited even to rough surroundings. Integrated condensate trap – very easily emptied. Fast and easy exchange of probes via the probe coupling. All gas paths are connected to the instrument at once with the bayonet connection. A range of probe lengths and diameters ensure a high degree of flexibility for all applications. To exchange the probe shaft, it is simply placed on the probe handle and engages. Easy exchange of probe filter.